Originally published on May 10, 2013 After getting a puppy, the next most exciting thing you get to do is buy puppy toys! Dogs enjoy toys and a good selection of toys is a great foundation for good environmental enrichment. 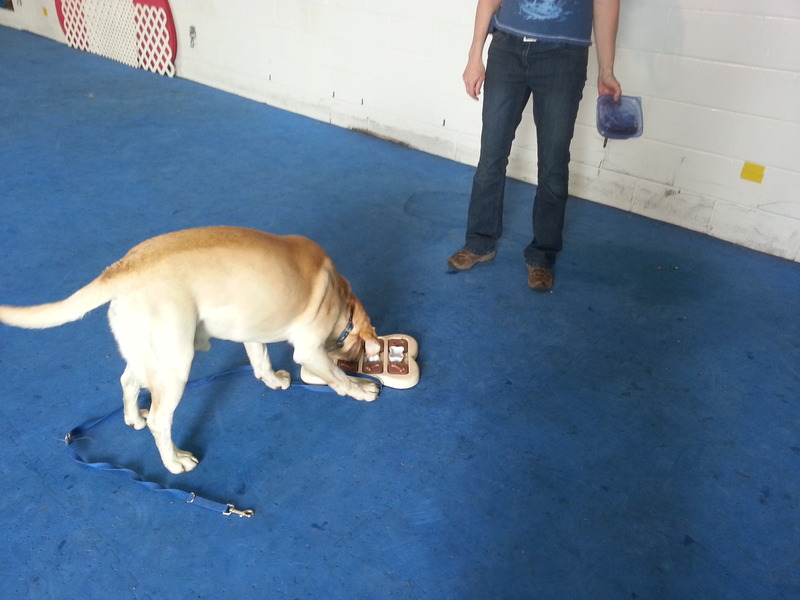 An enriched environment helps dogs grow better brains and develop better problem solving capabilities. There are now thousands of different toys on the market to choose from and it can be difficult to determine which toys are safe and which ones are not. I use three criteria to decide if a toy is safe. The first is the size. The toy must be large enough to not be a choking hazard. The second thing to consider is the integrity of the toy; are there bits that can come off? The third thing that I consider is the hardness; can you twist the toy in your hands? If you cannot twist it then it is too hard for your puppy’s teeth. Let’s consider size. 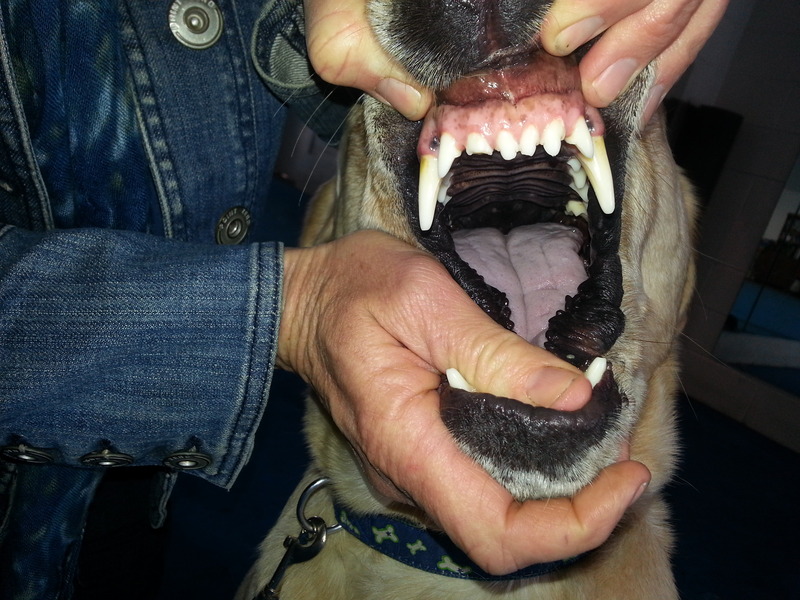 When you look at your dog’s lower jaw, you can feel where it is widest. All your toys should be longer than the widest part of your dog’s lower jaw. If the toys are not longer than this, they can get stuck between his back teeth or worse he could choke on them. When you look into this dog’s mouth, you can see the distance between his upper back teeth. Toys must be large enough to not get past these teeth or your dog might choke. 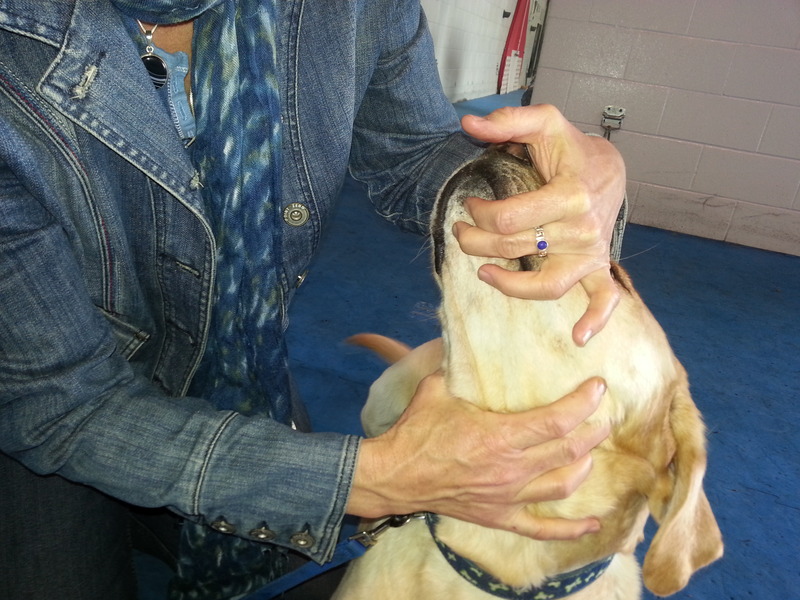 Using your fingers on the outside of your dog’s jaw you can measure the width of his jaw. All toys must be larger than this to be safe. Integrity of each toy is another part you need to look at. If the toy has broken parts, we have to make certain that they cannot come off of the toy. Some toys are glued or fused together and they can come apart and become a choking hazard. When purchasing toys, check to make sure that they do not have loose parts that could come away and choke your dog, but even with toys that are a single piece, make sure that bits have not been chewed away releasing a potential choking hazard. This rope toy is a serious choking hazard, not to mention that if your dog does swallow strings and they get entangled in his gut, then they will be really hard to find if your vet needs to surgically remove them. Rope toys are generally longer than your dog’s jaw is wide, but they contain a special choking issue. Because rope toys are made of strings twisted together, as the puppy chews, the individual strings can come away from the larger rope and become a choking hazard. 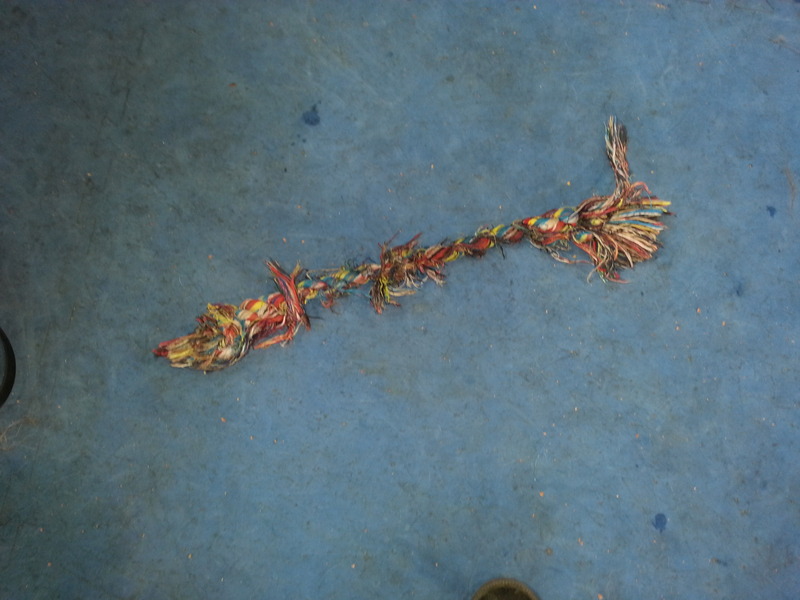 Some rope toys have been sold as dental products, indicating that they might naturally floss the dog’s teeth. If you cut these toys up, you will often find that they are made of soft cotton string that disintegrates when tension is put on the individual strings. These small pieces of string can easily be swallowed and create a blockage in your dog’s gut. Toy blockages are a veterinary nightmare for the dog, for the owner and also for the veterinarian. The last thing you want to do is to cut open your dog’s gut to search for bits of toy, but if your dog has a blockage that is the only way to get items out. These surgeries are highly risky and exceedingly painful for your dog. Prevention is the best medicine. The final criterion that we are interested in with toys is hardness. Bones are the traditional item to give a dog to chew and most dogs really do love them. Some diets call for you to give your dog raw bones. The risk with bones is that they may leave scratches and chips or worse, slab fractures on your dog’s teeth. Veterinary dentists now recommend that you test your toys be twisting them in your hands. If you can twist the toy in your hands, then it is not too hard for your dog’s teeth. Many people still like to give their dogs organic treats such as rawhides, beef pizzles, pig ears and other bits of dried animal tissues. Almost every dog will eat these but there are some issues with these too. It is very easy for a dog to bite off a piece of rawhide and choke. Bits of organic toys can become trapped in your dog’s gut and then swell creating a serious blockage; much like a string toy. One of the real difficulties with these items is that they are animal flesh, making it even more difficult to find them inside your dog if there is a problem. In terms of tooth damage, there is one more toy that bears consideration. The tennis ball. Too small to safely meet the needs of most dogs, its surface has also been implicated in enamel wear in dogs. If you are going to play ball with your dog, it is important to choose a ball that will not wear down his teeth. In Canada we have something called a street hockey ball, bright orange and smooth plastic that met the requirements of Dr. Haws, the veterinary dentist who advised us about the risks of hard toys and tennis balls. Once you have determined that a toy is a safe toy, then you can classify them into a number of different categories. The first category is the toy you and your dog play with together. Then there are the toys that your dog might play with alone. Finally there are pooch pacifiers. Tugs, balls and puzzles fall into this category. Amongst these toys are items that may be hard, but are not intended to be chewed, such as wobblers-the very large hard plastic toys that dispense food when your dog makes them wobble. They have a hole in them for the food to come out, and they are heavily weighted so that they spring back up once the dog stops moving them. Many puzzles have small parts for the dog to remove in order to get to a treat; under supervision, some dogs can play very safely with these toys. They are intended to be shared between an owner and the dog, and dogs should not be left unattended with these toys. You can teach your dog many things with puzzles including how to solve problems and how to find things he cannot see. When a dog is stuck with obedience exercises, we often reach for the puzzle toys to help the dog to start to think more creatively. This lab is playing with a puzzle toy under supervision. Puzzle toys like this are great for teaching dogs to think “outside of the box” but are suitable only for dogs who are supervised and willing to give up the small parts that could be potential choking hazards. Tugs are usually made of fabric, and fabric is usually made of strings or threads. We will use these for tug games, and keep in mind that a loose thread can result in a pulled tooth or injured mouth. After each tug session it is important to go over the item carefully and cut away any loose threads or loops of thread to make the toy safe. If the toy becomes excessively worn, then you should discard the toy. Toys that you use to play with your dog can be very important tools in training. The very best training is like play; you take turns, you get behaviours you want and the dog gets to have or do things he wants. 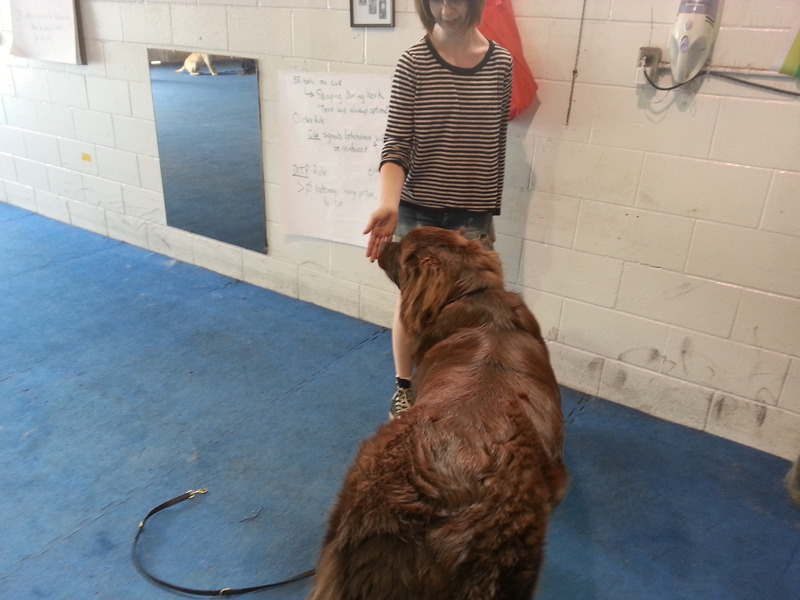 We even have a special name for training that involves behaviours as reinforcement for behaviours; we call it Premack. When you ask your dog to sit before you throw a ball, then you are using the Premack principle to reinforce sitting. The best play between dogs and people has clear rules were everyone can get what they want out of the activity. 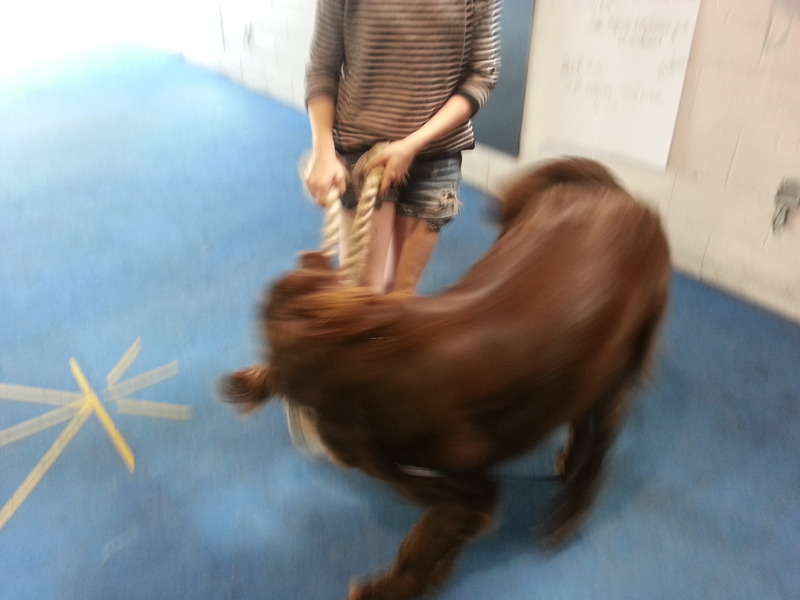 First you do a cued behaviour…..
And then we click and tug! This form of play training has its own special name; we call it Premack. Notice that although the trainer is using a rope toy, it is a rope in good condition that does not risk broken strings that could be swallowed. The next category of toys are those toys that your dog may play with when you are not around. These toys include some of the larger rubber puzzles, really tough Frisbees, large kongs, herding balls, and other items that your dog can engage with, either by himself or with another dog or dogs. These items need to be really indestructible and you must check them regularly to ensure that they remain safe and are not damaged. The final group of toys, the pooch pacifiers, are toys that we can use to help the dog settle and stay calm and quiet. These are stuffed kongs, legal chew items and items your dog finds soothing. We have seen dogs who have a favourite cushion, bed or blanket that they really snuggle into and relax with. Pooch pacifiers are not intended to get the dogs thinking, but rather to get them to relax and rest while we are either away or doing things that cannot include the dog. These are great tools for when you have workmen in your home and you don’t want to interrupt what they are doing. Recently a Weimerainer made the news when he got his tongue trapped inside a rubber toy. The toy was the right size and it was not too hard for him, so what happened? The toy (it looks like one of the new Nerf dog toys) only had one hole. When the dog deformed the toy with his mouth, and then released it, a negative pressure zone was created and his tongue was sucked in. Once his tongue was inside the toy, a vaccuum was created and he could not get it out. As blood pumped into his tongue, it became swollen making matters even worse! Inspect all of your rubber toys and make sure they have a vent hole to prevent this from happening. To test them, simply form a seal around the obvious hole with your lips and blow hard. If you can blow through the toy it is safe. If you cannot, then you must either carve a hole to allow air to come in and out when a dog’s tongue is inside the obvious hole, or discard the toy. Be very careful when purchasing toys to ensure that they will not create a vaccuum in the toy if it is deformed! We were very excited when we saw Nerf’s new line of dog toys, but when we inspected them, we could not recommend them because none of them have an escape hole. We contacted Nerf twice via their website and got no response. We urge consumers to alert Nerf to this danger and hopefully their otherwise terrific toys will be remodelled so that they are safe for our dogs.